Along with Light & Sound Machine at Third Man Records, the Track 1 building in Wedgewood/Houston is becoming one of the best places to see underground and experimental video art. 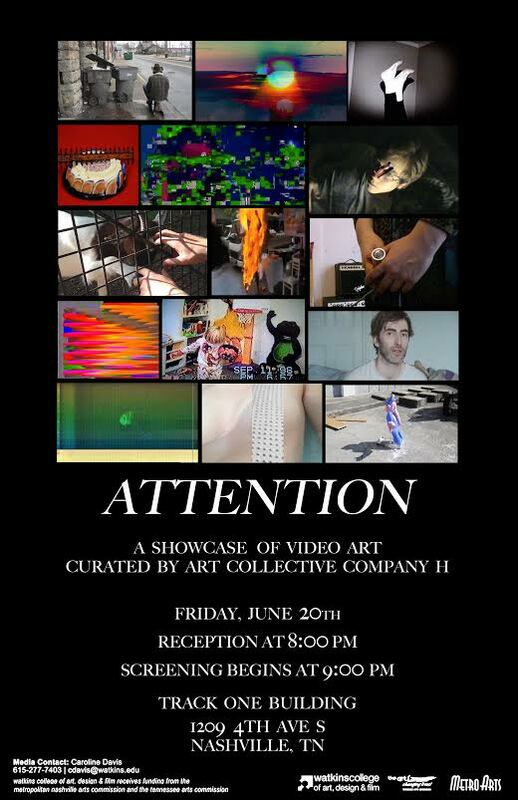 Case in point: this video art show Friday, June 20th at 8:oo p.m. In an effort to combat culturally induced impatience and shortened attention spans, student art collective Co. H presents ATTENTION, a juried, hour-long screening of video art. Time-based art (in other words, work that is to be experienced in duration) suffers as a result of this condition. As such, the work here is presented in succession, as a screening, rather than installed in space to be addressed in passing. ATTENTION features 15 videos from both students and professors working regionally in Nashville and Chattanooga, as well as from artists based nationally in Pennsylvania and New York. They really hit the nail on the head about the difficulties showing time-based art. “Bring Your Own Beamers” and such are great for creating a massive sensory assault, but they’re not great for highlighting each artist’s individual piece. On Friday at Track 1, you’ll be able to give each piece your attention without distraction. Most of the names on the list are new to me, but I do notice Kellie Bornhoft and Morgan Higby-Flowers, who participated in the 2014 Circuit Benders’ Ball; Ann Catherine Carter, an artist and musician who is taking over for Veronica Kavass as the gallery director at The Packing Plant; and Tyler Blankenship, filmmaker, musician, and chief archivist of the current Nashville art scenes. Friday, June 20, reception at 8 p.m., screening at 9 p.m.